Guys, I apologize for my overuse of this purse. It's just so dang versatile I want to wear it with everything! Phew, now that that's off my chest... I'm wearing this little getup right now. I've worn this dress as a shirt before with this skirt, but finally I'm getting around to photographing the outfit! I love the colors together - what do you think? This dress's print has always vividly reminded me of fish scales. Odd, but I can dig it. On a personal note - yesterday I got together for coffee with Derek, my ex of a few years ago (long time readers may remember him). I haven't seen him for a long, long while. We caught up and swapped stories before parting ways. It's interesting how time works, isn't it? One day you think you are completely in love, and then two years later you're in a whole different place. Seeing Derek made me realize that it is so completely true that time heals all wounds. I hope that by next summer or even sooner, I'll be able to sit down for coffee with Nat and it will be as easy and simple. I love the jewelry you are wearing, and the outfit is smashing. It's a good thing you were able to enjoy having coffee with your ex. I for one don't really wish to see mine again. I've never ended on a bad note with an ex, but I don't really have a desire to get coffee with them again, haha. Such a pretty outfit! And you're forgiven for the purse- i'm the same way with my topshop boots. i can't seem to find anything else to put on my feet. Cute! I love everything about this outfit! You are so adorable! I love it when you can wear a dress as a top! I adore those sunglasses on you. You just have such a pretty shaped face, you're so lucky! I found your blog on Introvert's Introduction's feature. You are too cute! This is a really fabulous outfit. 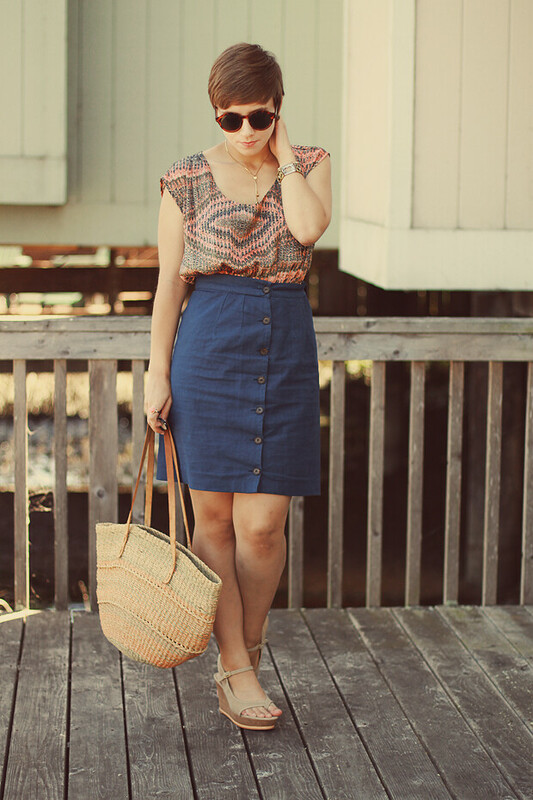 I love the colors & I've been looking for a skirt like that. super cute sunnies! and that skirt fits you flawlessly! there are just bags like that, you know? i have a bag i continuously put on my blog because it goes with everything, it holds everything, and it's like the nicest thing i own. any bag i can put my camera in is my best friend. and i love these sunglasses - i kind of want a pair, but that would deviate from my love of clubmasters and i think the ray bans might get angry at me because they obviously have feelings. (not at all) but still! and the colors of this outfit are so beautiful - i love that top. Your outfit is so classic and timeless. I especially love the buttons on the skirt. I absolutely love the pattern of your blouse. Looking lovely as always. you look so cute! great colours, and that necklace is GR8. Wow, has time flown by that fast already? I remember him from first reading your blog a couple years back. It is really something how time does heal those open wounds. Thank goodness for that! I'm glad coffee with your ex went well! I love the shoes and bag. They really make this outfit. You style is so mature and classy for somebody so young. Love your sunglasses and the way you adapt for the hot climate! Such a classic, cute outfit. 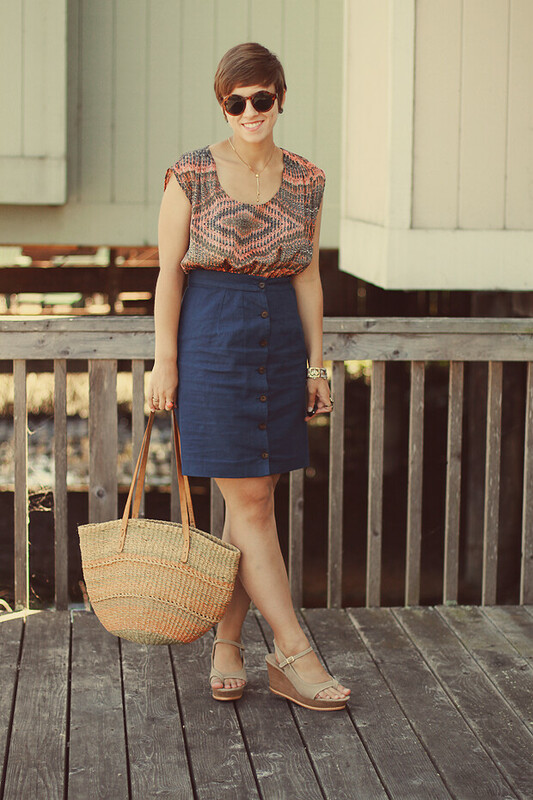 I love that navy button-down skirt and the print on your top is really cool. I definitely understand why you use that bag so much! It's perfectly summery!